Mar. 22, 2013 12:00 p.m. 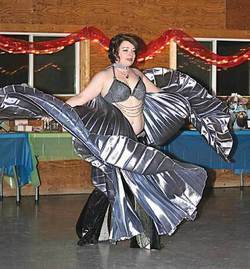 This lovely lady is just one of the dancers from the Edmonton troupe called Raq A Belly that entertained the crowd at the ladies only fundraiser last Saturday night at the Leduc Lion's Campground. The night was dedicated to raising funds for the Canadian Diabetes Foundation.